I flashed the new SPL and radio that also came with the T-Mobile Froyo OTA giving myself an extra 15 MB of RAM. This post attempts to compile the background and links to the knowledge needed to do this safely. Because this is much more complicated than rooting with universal androot, and you can very easily brick your phone, this should not be done if you don't fully understand the process and aren't comfortable using the command line. While I believe someone may have created flashable signed zips for doing this, the recommended way is to use fastboot. Without swap, that is an additional 14.8 MB of real memory. The ht-03a shipped with a "perfect" SPL that does not allow remote fastboot. Therefore, an interim engineering SPL will have to be flashed in order to use fastboot to flash the new SPL (1.33.0013) and radio. The new SPL is also perfect, but a version was modified for the Dream/G1 (1.33.0013d) that allows a few fastboot commands, such as fasboot erase system -w for a complete wipe. Fortunately, 1.33.0013d has been confirmed to also work on the ht-03a, a Google-branded 32B magic. Even with the modified "d" version of the new SPL, you cannot remote boot a recovery image, flash new splash screens, flash a new recovery image (if for example yours became corrupted). You will have to flash an engineering SPL, do what you must, then reflash 1.33.0013d. Unlike flashing ROMs, flashing SPLs is not 100% risk free. I'm sure this will probably get some feathers ruffled, but I am leery of clockwork recovery and ROM Manager. As outlined here, this is not the developer's fault but a low memory issue. Perhaps this new SPL and radio will fix that, but the fact remains that there have been a number of instances Dream and Magic users getting stuck with no working recovery. With an Engineering SPL, this is no problem because fastboot flash recovery recovery-RA-sapphire-v1.7.0G.img fixes this, but with a perfect SPL, it will be much more difficult, as in making a goldcard difficult. Another fact is that I have yet to hear of this ever happening with Amon_RA's recovery, and ezterry at XDA is suggesting to use Amon_RA. However, using Amon_RA means you can't use ROM Manager. If you are like me, you never cared about kernels. Yeah, you might have been interested in testing out some of the overclocked kernels but you were perfectly happy to use whatever the developers included with the ROM, which will likely be the most stable way to go but maybe not the fastest. Stability versus bleeding edge. For the time being, those days will be over. All of the cooked ROMs available right now will need a patched kernel that may or may not be included with the ROM. I have no idea what is the "best" kernel. It will depend on what makes it the best for you. Start with ezterry's XDA write up with links to the radio and SPL. If this doesn't make sense, stop and read more. If you don't already have one, read the instructions on flashing an engineering SPL. The SPL in the above link comes from this list of engineering SPLs. Finally, you'll want to understand how to flash Amon_RA's recovery because it is less prone to problems than clockwork. If you plan to use CM 6.1, ezterry's CM Forum post contains a port with the new radio. The T-Mobile US Froyo OTA with a cyanogen kernel I've been running lately is by far my favorite ROM due to speed and stability. I've mentioned missing some CyanogenMod features, but when it comes to my phone, stability trumps the bleeding edge. So I 1) did a nandroid backup of my current ROM, 2) updated the SPL and radio, 3) restored the backup, 4) flashed the patched kernel, and 5) picked up where I left off with no loss of data on my phone. The actual work involved for me was about 10 minutes because I already had an engineering SPL and Amon_RA. I spent infinitely more time writing about this than I did actually experiencing it. So far, all seems fine, but I'll need a bit of time to test. Wifi and GPS are working, and the phone does seem snappier. I haven't had a chance to see how battery life is. There are two choices of radio, 2.22.27.08 or 2.22.28.25. The former came with the OTA. The later is a newer radio. Depends on who you ask and where they live, which is better/faster/easier on the battery. For now I am using 2.22.27.08. Rebooted to recovery and nandroid backup my current ROM. Downloaded all necessary files and checked the MD5 sums against what was published. Mounted my SD card, copied the kernel installer to the root of my SD Card, and rechecked the md5 sum. Reboot to recovery and restore ROM. Here are the hboot/radio combinations I've had on my ht-03a, beginning with the Docomo stock configuration. After that I used the same radio with an engineering SPL. This was prior to universal androot with no one-click option for 1.6 Donut; An engineering SPL was required to root. 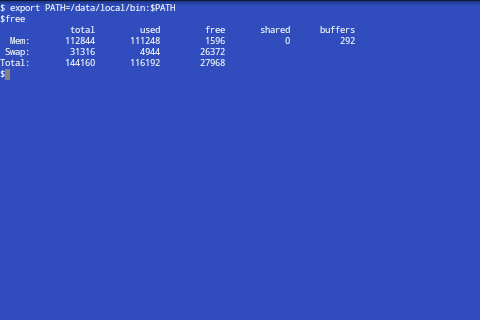 Finally, I'm back to a mostly perfect SPL but with an additional 15 MB of real memory. NOT follow these steps but use them as A Docomo ht-03a SPECIFIC REFERENCE for ezterry's instructions. If you are unrooted, root your phone and flash a custom recovery. clockwork is fine to start with. Download and flash an engineering SPL from recovery (e.g., 1.33.2009, though I have been using 1.33.2005). VERIFY MD5 SUM after download and after copying to SD card. Reboot to fastboot (power + back). Download Amon_RA recovery (NOTE: that the code in exterry's guide is specific to a dream ht-03a users need a sapphire recovery tagged "G". "cyan" refers to the color scheme, not cyanogen.) VERIFY MD5 SUM! 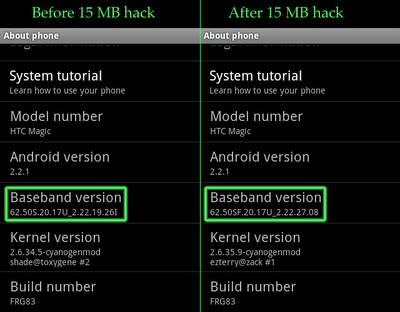 Restore your previous ROM and flash the "2708" ported kernel of you choice. 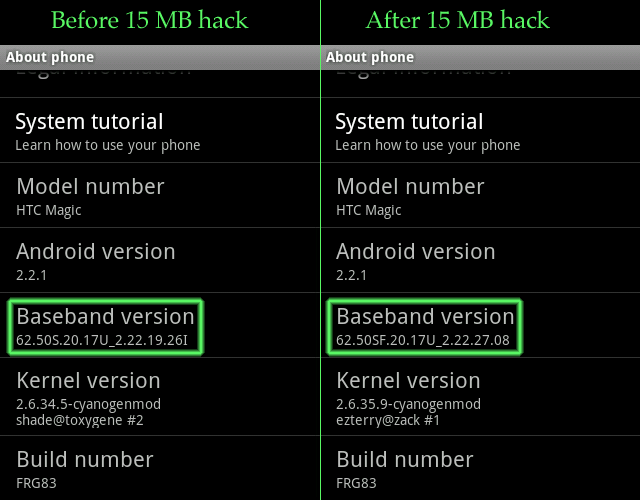 Or follow these directions for CM 6.1 after rebooting to recovery. Have you noticed an drastic increase in performance? I really need to use it for a week to make sure there aren't any surprises, like massive battery drain by the radio, but after a day's usage, I can say it surely seems worth it. After having many problems with the goldcard method, I just rooted my ht-03a to cyanogen 6.1 I am very satisfied, however the hardware did show its age. I would like to ask how hard was it to upgrade from a mac? Sorry, not following you. what do you want to do with a mac? upgrade what? you want to flash the new radio and spl with a mac? If so, yeah, you can do that. I did it with a mac. I've never heard of rom ripper... got a link? I meant rom manager not rom ripper. I downloaded a program called rom gripper and got the 2 confused in lack of sleep. If you use Amon_RA, you can't use ROM Manager. I think it would be safer to use Amon_RA. I can find my device in recovery mode when using ADB, but not in fastboot usb mode. Did you ever encounter this problem? I had to reboot to bootloader to perform wipe the phone. I am running Froyo Yoshi build 1.6 and I am amazed at the battery capacity compared to the cm 6.1 stable. The rom is blazing fast. I tried to push my luck with games like slice it and angry birds. Angry birds is bearable, but slice has a horrible frame rate and just freezes. I knew the hardware would not be able to handle some of these high end games. Angry Birds Seasons really did surprise me how well it runs on older hardware. Thanks for the indept article on how to go about successfully replacing your SPL and radio. Anyways, let us know what your final word is on the 'upgrade'. With Yoshi Froyo and the new radio/SPL have dramatically improved my battery life. I would definitely recommend this to anyone. softbanksucks have you noticed the increase of battery life and performance? Not really so much of a change in battery life for me because I've been running the ROM off which yoshi is based for a while now. I've also set the phone to underclock on demand to around 122 MHz. Performance difference is great though, mainly for multitasking. Often I don't have to wait for apps to reload when switching quickly between them now. Finally got around to doing this. Talk about scary but well worth it. maybe now I can wait until September when my contract is up. I keep telling myself how much better the phones will be then. Plus I don't really care for any of the spring models other than the LG Tab but I think I will buy the WIFI Xoom from KDDI when that gets released in April. It does make a difference, doesn't it. I too am going to keep this phone until at least the contract runs out later this year, perhaps longer depending on what's available and what's on the horizon. Yeah it actually makes the phone feel like a newer phone. Hopefully they have some really cool phones come the fall. Since we will be able to unlock them too that will be a plus. > While I believe someone may have created flashable signed zips for doing this, the recommended way is to use fastboot. my experience is totally opposite -- it's very likely to brick your phone while using fastboot, if for any reason there's a slight problem with your USB cable or USB host or anything at all, including power surge from microwave during the reflash process. on the other hand, reflashing .zip from SD card proves to be quite reliable as long as you keep your battery level above 50% at the beginning. and it takes 5 minutes at most to create .zip file if you already have all the ingredients. where zip is the standard zip utility and sign_update script was found and downloaded from somewhere on XDA. regarding the USB issue -- it's not really necessary to actually yank the cable out, but even the smallest problems during the data transfer will result in bricked phone, which might be recoverable if you were flashing system image or not recoverable, if you were flashing HBOOT/SPL. you might not even know if your USB port or cable is faulty, in my case it worked perfectly for a few years with my photo cameras, but just slightly failed once during a high-speed USB data exchange in a fastboot. fortunately I was flashing system image and managed to recover, promising myself never to do the same mistake again. Glad to hear it happened when you were flashing something that could be easily fixed in recovery. I'll edit the post to include your thoughts. All set to try this, but have run into a snag. Seems I can't find anywhere to download the fastboot utility. All the links from SBS refer back to a spectacularly unhelpful HTC Developer site, and endless googling has proven fruitless. Am I looking in the wrong places or for the wrong thing? Or is fastboot no longer available for download? Quick look and finding a precompiled fastboot utility is now not as easy as it used to be. HTC did kill all those links. I can share mine, but it is for intel mac, so it won't work for linux or win. Nicholas probably has a binary for windows. As mentioned above, flashable zips were created, but it might be hard to find them now, especially if more links have changed. The one I have is for Linux. Thanks fellers. I downloaded and set up the SDK on my Slackware install, but there was no fastboot. Looks like I'm going to need my w7 partition after all. Looking forward to it...the ht-03 flies now that I have it overclocked and swapping, hopefully this will be the icing on the cake! Great stuff, keep up the good work, and thanks again. Rufus, Nicholas has the linux binary. Nicholas, how about zipping and posting your linux binary to google docs? Or send it to me and I'll post it along with the mac binary. I just uploaded it to Google Docs and shared with you. I also uploaded my "Platform-Tools" folder since you don't really need the whole SDK for most of what we do. Got it. Excellent. I'll let you guys know how it goes! Cheers! Finally got a chance to sit down and make the upgrade. Works a treat, thanks to you guys. A special thanks for going to the trouble of putting fastboot up on google docs for me. My HTo3a runs like magic!